Looking to chow down on some plant-based sushi? Local chain Beyond Sushi has you covered with its sixth location in SoHo, as we previously reported. Located at 215 Mulberry St. (between Spring and Prince streets), the eatery serves dumplings and noodle salads in addition to its colorful rolls incorporating purple rice. 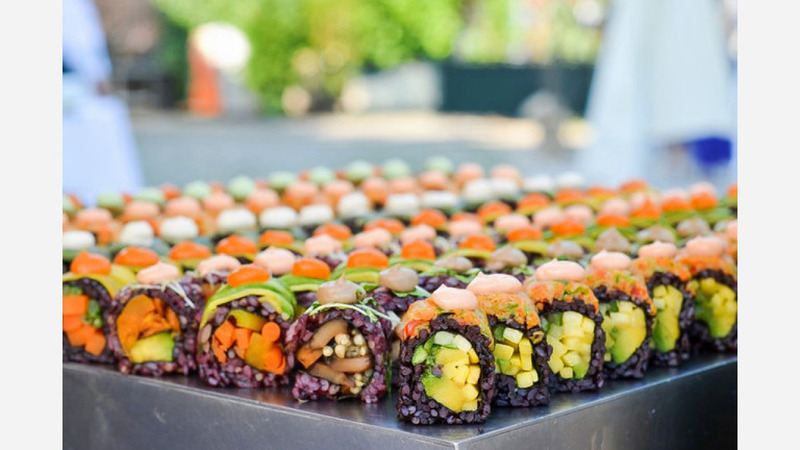 Sushi options include the Spicy Mang, with black rice, avocado, mango, and English cucumber topped with spicy veggies and a toasted cayenne sauce; or the Mighty Mushroom, with four-grain rice, enoki mushrooms, baked tofu, braised shiitake and micro arugula, all topped with a shiitake truffle sauce. The new sushi bar has garnered rave reviews thus far, with a five-star rating out of two reviews on Yelp. "The new location is very bright and open, and the service has been quick and friendly both times I've been," said Kris C., who reviewed the new spot on May 3. "I always get the Spicy Mang roll, and they're always consistent with the food. ... It's great to have a vegan spot with so many different combinations of flavors for sushi, as opposed to being stuck with a simple avocado roll every time I want sushi. " Swing on by to take a peek for yourself: Beyond Sushi is open from 11 a.m.-9:30 p.m. daily.